Do you work for Audition? Learning about Audition? We can help. Product Manager, Audio at Adobe Systems, Inc.
"One and only digital audio workstation that you will ever need"
Adobe Audition is the best digital audio workstation that I've ever used. 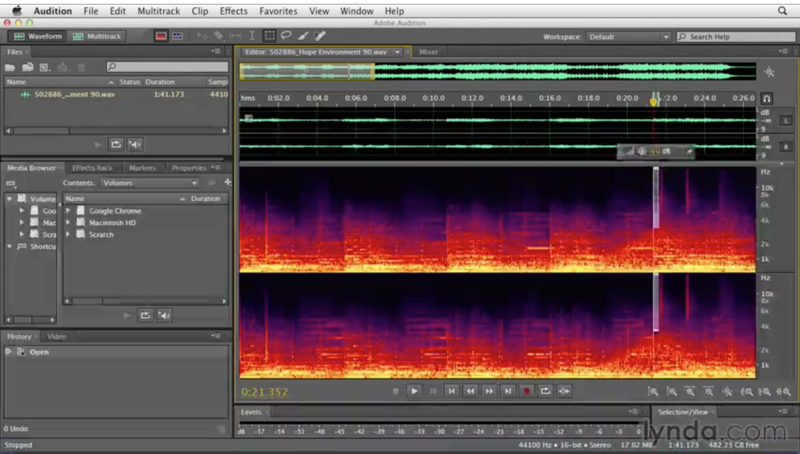 DeReverb & DeNoise is the most commonly used feature of the Adobe Audition. Using that feature, I could reduce or totally remove the reverb and backgruond noise from the recordings that I took. It is so useful when a professional grade annousement is released. Other than that, On-clip gain control and waveform scaling, multitrack clip improvements, timecode overlay, Improved playback and recording performance are the other most used features in Adobe Audition. There is nothing to dislike. The best digital audio workstation ever. Adobe Audition is the best digital audio workstation that I've ever used. Go for it without keeping any doubts. Using DeReverb & DeNoise feature of the Adobe Audition, I could reduce or totally remove the reverb and backgruond noise from the recordings that I took. It is so useful when a professional grade annousement is released. "Really great for editing podcasts"
I just recently started a podcast with my friend. We are very new at audio editing, and I was scared to make an attempt at editing our podcast episodes. However, after a quick tutorial I found Adobe Audition to be easy to use, intuitive, and the effects made my podcast sound so much better. We now use Audition for every episode and it keeps blowing me away with how simple it is to create a professional sounding audio track. The cut and past actions are so simple, and there was really no learning curve when it came to using this software. Even for a beginner it is very easy to use. I have no complaints about this software. It is incredibly simple and the customer support is helpful. I am trying to think fo a suggestion but there really is nothing. Make sure you learn about the different effects! You can also save presets so you can increase productivity! The greatest benefit of this software is how easy it is to edit a track and cut out certain sounds. Editing with Audition has made my podcast sound truly amazing and professional. I love the effects and the ability to create presets so it's easier to edit my show. I also enjoy the interface of the multitrack area, it makes it simple to add transitions and additional sounds to the podcast to make it sound polished and professional. I like Adobe Addition for many reasons. It is very user-friendly and can be a standalone tool for audio production as well as a great extension to Adobe Premier and any other video editing software. I like that it is straightforward and intuitive and the more that you learned the more you can delve into the Advanced functions of the application. There is nothing that I dislike about Adobe Audition. I highly recommend trying to Adobe Audition for any video or audio production that you would like to enhance the audio on. I use Adobe Audition for my video production business as well as audio consulting. It has allowed me to greatly enhance D audio editing and engineering in the video is that I am producing and has save time and money from having to outsource audio engineering for my video productions. "Excellent tool for composers and audio amateurs"
Well, although is a great DAW, the midi and vst engines are not that great, so, its more for handling audio that is already made, for composers who work with midi I would never recommend it. Also, there is not a real way to control, or at least not user friendly to manage those files, so things like aplying a vst into a midi file are a nightmare. I would totally recommend you to only use adobe audition as a audio tool. More than anything,audio conversions(to wav, to mp3, to aif etc) and everything related to correction, for example, I work a lot with singers, so the edit tool is actually really powerfull to fix "hums" and sileneces. "The best all-in-one digital audio workstation"
Adobe Audition is the best all-in-one digital audio workstation that I could ever find. There are loads of very useful features in Adobe Audition. DeReverb and DeNoise effects, On-clip gain and waveform scaling, wave trimming and merging are some of those. Mainly I use DeReverb and DeNoise effects to fine tune the recordings. 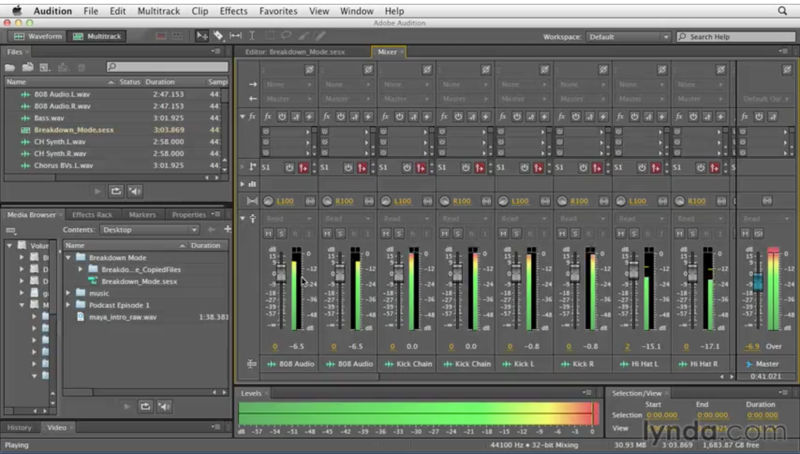 By doing simple tweaks with the software, a professional grade sound output can be achieved. There is nothing to dislike. It is the best overall digital audio workstation ever. Adobe Audition is the best all-in-one digital audio workstation that you could ever find. Keep no worries and go for it. I mainly use it to fine tune the recordings. Then those recordings are used for automated instruction systems, voice guidance, etc. "Easy and is making me look really good"
The learning curve for Adobe Audition is pretty flat, actually. After just a little while playing around, I was able to get into a groove and edit my podcast effectively and easily. I love the pre-set templates for podcasts and other projects. I'm still learning a bit about some of the finer points, but this is a great product. I wish you could input an audio file an have the different tracks/layers separate to edit them individually. Kinda like how the layers separate in Photoshop or Illustrator. Especially if the file was created in Audition itself. Don't be afraid to dive in! Once you get the basics of how it works, it's really quite intuitive. I'm creating a podcast for my work. We conduct interviews and produce stories using Audition. "Amazing tool to Mixing and Mastering." Spectral edition: You can select freely in a range of frequencies with the effect Brush tool and apply these effects to the selection in several degrees. Perfects a selected interval and automatically repairs clicks, pop-ups and other noises using the spot correction brush. Compatibility of virtual instruments VSTi: Compatibility with a wide variety of virtual instruments. Add midi MIDI tracks to your mix, you can choose an instrument and then record a new sound in the Sequencer. Multitrack edition: This is one of my favorites, because it allows me to add different sounds to the main audio like fillings, ad libs, or any effect of organic sound in different tracks, being able to join them at the end to give a true touch of authenticity to my songs. Save time and increase accuracy by editing groups of clips. Use the functions of automatic gradual transition with clips in multitrack view; In this way, you can mix files quickly. I would like an improvement for the audio quality; what, is good, but not great. I would like to record some of my instruments to give my own touch to the music that i produce, but sometimes i feel that the audio quality of the sound that i recorded i just not good enough to my quality standars. Audition is designed to give audio professionals a package of flexible tools for production, recording, mixing, editing and mastering. With extensive domain and restoration, audition allows professionals to create music and Spots as well as restore faulty recordings with sophisticated editing tools. I learn to used it with a friend that had his own home studio, and eventually i ended taking that same way. I love the precision that Audition give me to edit the sound, also the efects and the many options that offers me to do the full production work (mixing and mastering) with a very high level results. Once you handled the many features that Audition has, you going to take your creativity to another level. Me personally use it to do the productions for my music and for any independent artist who hires my services. the interface provided by Adobe is really awesome and good looking. you have multiple multitrack editing panels and all the essential tools needed to edit. also, the interface is customizable by the user which gives a lot of options like you could create your own workspace and save it for later, in that way you can save a lot of time on editing. the program is a part of the Adobe creative cloud suite which means you can easily work with other creative cloud products like premier and after effects. you can also work with adobe captivate and export the audio directly into it after editing which i find really helpful. the pricing isn't cheap and needs a subscription to get you going. comparing with most of the other sf=oftwares in the market the price is on the high side and most of the average users won't be able to use it. the software, unlike many others, is very hard to learn for a complete newbie. you either need time or knowledge in a previous version to get going. this is not a software like many where you can do your quick edit, it needs a lot of work to make it look good. the software is best suited for post-production comparing to music production as the software doesn't support virtual instruments or MIDI. this is not the best you can get when it comes to music production but for post-production, nothing beats it. post-production of audio, this might be the best software out there. "Really good for editing sound recordings"
I like the phase scope, that shows me if my audio has issues with stereo image. It takes a lot of disk space to use Adobe Audition, and I find myself having to clear space on my ultrabook computer when I am using Adobe Audition. The phase scope is useful and I could not find it when I used Audacity. I use Adobe Audition for editing sound recordings. Sometimes we have recordings of interviews that we host on our web site. I use Adobe Audition to edit and remove the quiet parts of recordings. I have found the stereo phase scope to be the best feature, as I can make sure stereo recordings sound good to the listener. "One of the best Great Audio Editor!" It's a Great music editor with everything that you will need and even more! It have the multitrack recording functionality, the excellent audio restoration feature. The GUI of the software is intuitive, clean and customizable, and the software provides an huge toolset to handle any type of audio. It's possible switch between different layout. Adobe Audition is a part of the Adobe Creative Cloud, so you will pay for the service on a subscription basis. The price is expensive for the entire suite (but it is worth every penny that has been spent). You can't customize the toolbar of the software. It's a very powerful tool, complete and customizable. If you are new to this kind of software it could scare you, but with a little practice everything will be more familiar. On the web there are plenty of tutorial that can guide and help you better understanding this powerful tool. Definitely for me the best audio editing software, absolutely recommended. With this software i can record single, multi tracks, editing them analyze the tracks and improve the quality of the sound (in fact it have a full digital mixer so you can adjust the levels like: volume,bass,mid,high, and so on) and other parameters of multiple audio tracks at once. "Not so easy, but a powerful tool for our music"
Adobe Audition offers you a lot of tools that you can use to edit and create your music. All the platform is a ready to go platform, with a complete interface and all the things you nees. Also really powerful are the automatic mixing track (that you can use to change the lenght of a song) and the noise removal function. It's not of course easy to use. But you can find a lot of tutorial on the internet. Adobe Audition remain a solid software with no problems. It is not the easiest solution, but I think it's the complete one. It's the best platform that you can use for your audio project. Use it. I use Adobe Audition for two reason. The first one is to mix and modify music, and clear and enanche the quality of the audio, of the video that we make for our clients. The second is to mix down the bussiness podcast that we are running. "Best Audio Editing in the Market"
Adobe Audition Creative Cloud is an extremely powerful tool. I used the tool to edit audio recording created and the best thing about the tool is the multi-track editing. it has a lot of features including audio mixing and filter. another great thing about the audition is the addition of plugin, it supports all type of VST plugins and gives you a lot more option while editing audio. its the part of the Adobe Creative Cloud suite and you could get Adobe cloud storage t safely backup your work, the Adobe support is great, not just the support replies immediately, they have the answer to the question every time and I found it really helpful. the interface is clean and customizable which lets you create a workspace according to your need, really awesome function. the pricing is a little high, even thou when subscribing to all the cloud products you could save few bucks for an average user audition is an expensive tool. the Creative cloud software update is a really bad, the servers can be dead slow and you could feel like it takes forever to update the software. it's the best tool available. go for it. edit and mix audio files. "A must for any podcast producers"
The versatility of the application, from multi-track recordings to fixing an audio file it can do it all. I also like having it link with my Premiere Pro projects, allowing me to work across both programs when creating video content. It can be difficult to learn if you have no previous experience with similar software. I would highly recommend getting to grips with some free software first. There are also some keyboard shortcuts that are in other Adobe software but sadly missing from Audition. Also ran into a strange issue when moving large multi-track recordings in a project with magnet tool enabled. Download the trial through Adobe CC, give it a go and I'm sure you'll love it. Audition allows us to create dynamic podcasts with ease, from the recording straight through to the finishing touches. "Best audio editing solution out there!" Adobe Audition is by far the best audio editing platform out there. I work in radio and as a DJ, and I use this software often for multiple applications. It's easy to use, quick and has the great name of Adobe to back it up. Adobe Audition also boasts a great number of features, making it the most robust digital audio workstation of its kind. Not much to dislike about Audition. Sometimes I wish buttons and workflows were organized a little differently. But, the great thing is that as with all other Adobe products, you can manage your workflow and customize and resize almost everything. Also, Audition isn't the best if you would like to produce music, but, that's not what it's intended for anyway. If you are looking for a fast and easy-to-use digital audio workstation that is also accessible for novice users, then this is the software for you. It's so quick and has so many options and features, it's nice knowing that there will never be an audio issue or goal you can't solve or accomplish with Adobe Audition. Take the time to watch tutorials and realize the full potential of this great software. This allows me to record, edit and export radio commercials and liners very quickly and efficiently. I'm able to deliver to clients very quickly. When something needs to be edited, I can quickly reload a session I was previously working on and edit as needed, then re export and send again. "Great tool for audio editing"
Audition is amazing for audio editing. Since the waveform is visible and dynamic, you always see how you are changing your audio file. The noise reduction is simply amazing and can turn a problematic shooting situation into really great result. The auto-heal too is also a welcome feature. You can get rid of pops and microphone peaks instantly with only one small selection and keyboard shortcut. Beyond that, the effects and controls that Audition has make fixing up audio really easy and hassle free. With it's integration with premiere, everything works so well - It's the main reason why we're committed to the Adobe suite. Some tools should be streamilined a little. In my opinion noise removal should be built into the UI instead of all happening in another window and interface. There can be bugs too. It seems every time I try to remove noise for the first time, it doesn't work. I need to reselect, resample, and then it works. I wish there was more auto-fix tools too. Especially for noise removal. The current auto-fixing tools never seem to yield very good results. Noise reduction is really great. Try always recording a good 10 seconds with no talking before your clips to use as your sound sample. The longer the sample, the better the result. We use Audition to fix poor audio from our Sony cameras. This happens when there's a lot of background noise or when there is corrupted audio. With it's integration with premiere, the workflow is seemless between the two programs. it's a very friendly program that i use to make mixes on songs. besides, trough the tool EFFECTS i can manipulate the frequency of determinate song in wich i want to make a change by clicking on " effects/normalize/0 db" and after that i change the amplitude of the sound wave by the route "effects/ amplitude/ limited forced/ 14 db" and back to normalize on -2 db. it makes kind of a re-bounce of the song and it really works for me on my shows. "Not bad for quick edits or repairing slightly damaged audio files"
Audition fits nicely in-between low-end and higher-end audio software. It certainly won't appeal to most professional music producers, but it does work well for hobbyists and part-time producers. It has grown out of a product called Cool Edit Pro, from many years back. Adobe has since purchased the software and has added features to make it more capable. It does some things very well, such as cleaning up audio that may have a little noise. It is capable of multi-track recording/editing, but I prefer to use Apple's Logic Pro for multi-track editing/mixing. There's just something about the layout that I don't like. It's perfectly usable, but it just doesn't seem natural to me. Maybe it's that it still sort of looks like Cool Edit Pro a little. Maybe it's that the controls are not all that easy to manipulate (such as track volume and panning. I'm not sure, but I just don't like the "feel" of this software. I only use it for correcting audio that is too noisy; something it does fairly well and without the need for other, more expensive software. Great for quick edits and repairs of slightly noisy audio. Not quite robust enough for a full music production house. I use it to repair audio from video that I shoot. Occasionally, there may be a hum or tasing car that makes its was into the recording; Audition is pretty good at fixing noisy audio - as long as you don't over-correct it. I use Audition mainly to clean up and amplify audio for videos I am editing. The noise reduction feature is very powerful and has helped me clean up background fuzz from many of my videos. I currently edit videos in Final Cut Pro but hope to start using Premiere Pro at some point and when that happens I will appreciate being able to go back and forth between it and Audition automatically. I like how all Adobe programs integrate with each other like that. This might be a small thing, but when you are editing an audio file, if the audio file is not playing and you click anywhere in it, the play head will move to that spot. When the audio file is playing and you click anywhere in the waveform it does not move the play-head there. There might be a reason for that but I would like the functionality to remain the same. I would recommend Audition to anyone especially if you use any other Adobe products. If you are doing video production in Premiere Pro this goes along with it perfectly. I am using Audition to improve audio for video production. "Adobe Audition: Compact and powerful"
I like Adobe Audition for being an easy-to-use software, in addition to allowing the integration of third-party plugins that results in obtaining more professional results. On the other hand, for those of us who work in the world of radio, Audition is a vital complement for the production of the programs and the editing of commercials, loops, jingles and the entire sound library with which we work in a live program . Nothing, is a tool that completely satisfies my needs. Although there are many other software for audio editing, and depending on the need, Audition is the best option due to its easy use, in addition to the best cost-benefit ratio, since for a lower price compared to other software, Audition provides a high level of performance with professional results, especially for those who make a living within the world of radio stations. It is easy to use and very intuitive, also allows the incorporation of many plugins to give more shape and body to the sound we require in our editing work. Therefore, if you are looking for a tool for audio publishing that allows you to achieve professional results with a low investment cost, the best alternative is Adobe Audition. Editing and mixing of audio tracks for the commercials of the clients in the radio, elaboration of loops, production of the radio program and other utilities within the elaboration of the radio program. Multitrack editor, pre-loaded with decent effects & tools, VST plug-in support. Noise removal tool is very useful for cleaning up low-quality recordings. Audition, at least "out of the box," doesn't have the music-creation features that Pro Tools does. Without third-party plugins it's more of a generic sound & voice recording/editing application, though there are a few basic music-related tools (Metronome, etc). I record and edit voice-overs for advertisements, and Audition is more than adequate for accomplishing this. I've also used it for sound design in animated bumpers and spots; The Multitrack editor has been useful for combining multiple VO, music and Sound Effect tracks into single audio files to put in my projects. I sometimes receive lower-quality VO tracks from clients, and Audition has EQ and noise removal tools that help make those files sound at least a bit better. Adobe Audition has an intuitive, functional layout. You can easily scan, enhance, and trim the wave file on one hand while also having fast access to other open files. Filters are displayed on the edge and quickly accessed. I do not have much in the way of complaints. Adobe Audition does everything I need and then some. My only grievances is for Adobe in general. I do not like their switch to a subscription-based only model. Thankfully I bought my product hardcopies before they stopped selling them. I am a recording artist/composer and like to edit my own audio recordings. 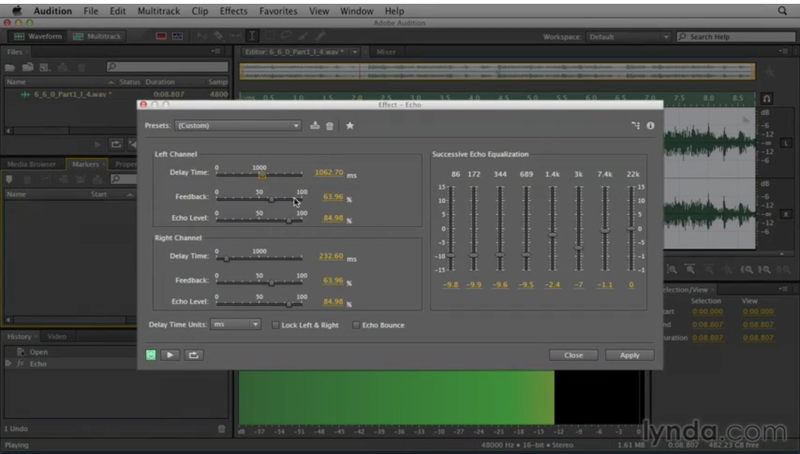 Audition makes it easy to cut static/noise, increase volume, add reverb, etc. all in one place. It is also easy to cut and paste section from multiple recordings. All files opened are displayed in a side panel, allowing you to easily switch between the different recordings. Audition also helps since it is integrated with Premiere pro. If a video recording needs better audio adjustments, it is easy to open the recording in Audition. This software is much more advanced that I'm used to, so certain things are easier and more automated than I've previously experienced. It's a huge time and effort saver, and I'm really enjoying exploring everything I can do with Audition. As a sound editing learner, one major advantage I have in using this software over my previous program is how easy it is to normalize sound levels. Audition cuts down the process from anywhere between 30 to 60 minutes to only a few minutes. Not only that, the feature itself sounds great on playback. I also have to commend Adobe on upping it's tutorial game, both with videos and in-program walkthroughs. One of the main barriers to learning a new software is the quality of educational materials that are available, and I don't think I would have tried this program had I not been immediately impressed with the level of learning support I can tap into. So far, I don't really have any dislikes to speak of. I may run into some issues as I continue using this, but (for the time being) it's been an overhwlmingly positive experience. If you have the ability, at least give Audition a try. The main problem I'm solving with Audition is editing audio for video. My company doesn't have powerful microphones for our video camera, so sometimes the quality of the sound needs some help. With Audition, I'm able to make adjustments and create a more polished product. "Superior audio editor, high learning curve"
The best, most unique feature of Audition is the spectral audio editing feature. This has worked to my advantage, especially when fixing background noise in production sound. It allows you to isolate certain frequencies along the timeline and attenuate (or increase) those frequencies for fine edits. For more generalized noise reduction, the de-noise filter allows you to pinpoint the noise you want to attenuate and manually adjust the reduction so you can maintain a natural sound.This is a feature I have never seen in any other audio editor, and I have used Pro Tools, Studio One, Reaper, and Audacity. I dislike that this has such a different work flow than other popular audio editors, which increases the learning curve. the constant switch back between the Waveform and Multitrack Edit windows can be conducive to radio edits, but I have rarely found that workflow useful for multitrack songs. Be prepared to spend some time learning this program. If you are transitioning from intermediate use of other audio editors, the learning curve won't be as high, but it's a new workflow to get used to for sure. If you're completely new to audio editors and the Adobe Suite, expect a few hours of tutorials before you start your first project! I am able to enhance audio with de-noise filters, and it's a full audio editor, so I can fine tune edits for any kind of project. I have used it more often in the past for radio edits, and currently use it occasionally for final audio mixdown for video projects. Audition takes all of the guesswork out of audio editing. It's easy to use, and things you hope it does, it does. It's a great program for first time users, but it's also a powerful program for experienced producers. There are so many facets that I have yet to explore with Audition, but I'm still getting everything I need out of it. One main thing: The fact that while in the multitrack when you adjust the volume spots at the center of the waveform, the waveform itself doesn't show the increase and decrease in volume. It's a guessing game if you're trying to get it up to the right volume. I know other programs (like WaveLab) have this feature, and I really hope it's something Adobe considers in future versions. Adobe recently made the switch to a monthly subscription as opposed to a one-off payment, but don't let that deter you. You can access the whole Adobe Suite if you feel like it, or just Audition. And, the best part about it being subscription is that you always have the most recent software. Just be sure to have Adobe Creative Cloud up to date so you don't lose all of your settings and shortcuts. Give it a try if you haven't, most libraries or other public options have it available. As a freelance audio/radio producer I do just about everything through Audition. It's helped me gain clients and develop strong workflow processes because of its ease of use. I've recently started to do more audio for video, and if my clients are using Premiere (also an Adobe product) I'm able to use their files with Audition and send them back without issue. "Professional software for the mid-level experienced user"
I came to Audition with a basic understanding of this sort of interface and audio editing. While it took some time and research to get a good hold of, it is intuitive enough to understand as someone a step above a beginner. There are not many explanations of the different features in Audition, so if you are not an expert in audio editing, it can be confusing. The online support articles are not always that useful, but I can usually find answers in their community forums. Having a solid understanding of sound editing is very helpful in using Audition, although not exactly essential. You can definitely work your way to understanding the concepts, but there is a learning curve involved. Audition has helped our company's podcast get off the ground relatively quickly and inexpensively. "Adobe Audition - Perfect audio editing software"
What I like most about this software is the amount of features it brings, the interface is very good and its windows and tools adapt to the screen efficiently. The manipulation of audio tracks is great, allowing you to edit the duration time and quality of it. The effects and filters that can be added at the time of recording are varied and provide the expected quality. When generating an audio project that is extensive enough and with multiple tracks or audio inputs, it tends to consume a lot of memory, but it is the minimum that can be expected from software that performs an excellent audio work. I recommend this software to all those people who are looking for audio work with optimal quality, it is excellent for small jobs to large projects. Without a doubt Adobe audition deserves an opportunity to be used, I recommend it 100%. I have used Adobe Audition in different audio projects such as recordings of songs or advertising singles. It has facilitated the work and its easy handling helps me to make each job much faster. "Adobe Audition, application in the form of a sound studio aimed at digital audio editing." You can perform the essential basic functions (import several tracks, insert plugins, fades of input and output.) Without losing quality. Adobe Audition concretely, I see it more as an audio editor, even more powerful than Sony's Soundforge or Audio Studio and for what it's pure and hard mastering I think it's great software. Produce superior quality audio for movies, broadcast, games and other projects more efficiently thanks to the easy bidirectional editing of Adobe Premiere Pro and the easy exchange of projects with other third-party non-linear editing applications and digital audio workstations . The audio hardware must be perfectly configured, because otherwise the program does not allow you to make the recording. When importing an audio file the program asks you to synchronize the sampling rate. With this program you can record and edit the voice, as well as we can record different sounds of things, animals, and musical instruments, it is used by different record companies and recording studios, because it has a great variety of effects and tools that They help us to make a mix of audio and recording in a professional way, also used by lovers of recorded music (DJ) mixes, although they do not use it thoroughly. "Professional tools at your fingertips, despite your experience"
As an amateur audio editor and sometimes engineer I enjoy Auditions feature set. There is incredible depth to the tools that they provide, but their online tutorials, youtube videos, give new users a sampling of the power, without overwhelming you. I have had to fight with Windows 7 / 10 audio device settings from time to time. I'm not sure if that's really an Audition issue or a Windows issue. Occasionally, I will not be on the correct recording input despite it appearing I am. Audition allows me to quickly edit sound files and get them closely matched in quality and profile. Our company has grown over the years, adding better recording hardware and equipment. We've scaled up with Audition as our needs and experience grew. "Graba y edita y monta tus audios "
- Acepta multitud de formatos de sonido. - Permite la grabación multipistas. - Es un software sencillo pero a su vez completo y potente. - Contiene un potente procesador dinámico, filtros, ecualizador gráfico y efectos numeros. A veces necesito usar el mismo archivo de sonido en varias pistas independientes para manipularlos de forma diferente, y los cambios que hago en uno se producen en todos los demás a menos que los renombre antes de cargarlos, esto hace que sea incomodo a la hora de trabajar de esta manera. Es una gran herramienta tanto para grabación multipistas como para la postproducción y edición de sonido. Además la aceptación de múltiples formatos de sonido, hace que sea muy versátil para trabajar. A la hora de editar archivos de audio para videos es fenomenal, podemos ajustar las pistas de manera milimétrica, y postproducir lo que sea necesario. I like the visual style of Adobe Audition, that makes it pleasing to work with for the long periods I use it for editing podcasts. It is quite slow at exporting long audio files, taking a few minutes for an hour long MP3 file. 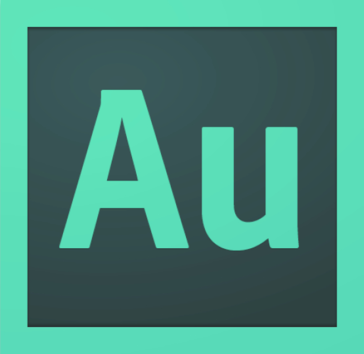 There are free alternatives but I prefer the visual style of Adobe Audition for editing podcasts. There are free alternatives but I prefer Adobe Audition. "Easier to use than Audacity"
How easy the program is to use and to catch on to. Helps with our podcast! Sometimes it's hard to move the sound clips to the precise area you want it to go without having to zoom in very close. Look at other options first depending on your need for a program like this to compare what it works best for. I like it best for podcasting, Audacity just was not cutting it. We started a podcast for our business and have been getting great feedback on it! "Audition is easy to use"
I'm not a pro at using this software yet, but the essential sound panel makes it easy for me to do basic editing. I don't have to go searching around the software to figure out how to do the things I need to do. I also love the Sound Remover tool for fixing background noise. This isn't a huge problem for me because I have access to Audition through my company, but for regular users of this program cost is prohibitive. It's $20 a month just for the one program. "Auditions Is One of The Best Audio Manipulating Software"
When it comes to editing and manipulating audio I don't think I have come across a audio editing software better than Auditions. The thing that I absolutely love the most about Auditions is its ease of use when it comes to using multiple audio tracks to mix down the perfect sound. I think people who create digital music will have issues as from my experience there is no support for MIDI or virtual instruments which does limit the experience to a extent. Another thing which I absolutely love about auditions is the batch processing as there are many occasions when I need to apply the same EQ to multiple audio files, Auditions makes it easy to achieve this. For people considering using Auditions the first thing I will say is to bare in mind that the software is probably better suited to post-production than music but the software still is a great software to deal with most audio editing requirements. In terms of the user experience for Auditions it is really user-friendly for anyone whether you are using the software for the first time or an expert user. On a daily basis I voice record various talents and use Auditions to mix down all the voice overs or any audio editing request. I also like the fact that the software consolidates most-used tools in one panel making it really easy to reuse some of my favourite tools. "First audio editor I've ever used, will be hard to surpass"
Audition has clear sound waves that make it distinguishable on where to edit. I started using it two months ago and felt like I knew its ins and outs within 2 weeks. Recording is a breeze. It converts to just about any format you need to use in media. The point/click can easily mess you up when you're editing. It's better to use hotkeys, which Audition has plenty of. I learned how to navigate it within weeks. And taught myself how to use its many features. Whatever you can think of using during audio editing, Audition has features for it. Soundbites and recording is through Audition. It is crystal clear to understand and easy to learn. "Not the best DAW (Digital Audio Workstation) but cerntainaly a good one!" Adobe Audition is a great DAW, in my opinion it is best suited to making podcasts or radio shows. it has an easy learning curve and the monthly payment plan makes it easier on your wallet because you do not have to pay the full price right away, especially good for trialing the software for a few months. customer support is also great! For now i will stick to Cubase, there is not nearly as many features as cubase or pro tools and some essential tools for me are missing. Ease of use. Multi track recording and editing. Easy control of each track. Volume and pan controls within the track and are easy to use. I can change volume within very short distances. I do not like Audition CC filing system. It seems as if all of the Audition products have the same problem. The biggest and worst problems with Audition is their filing system. Everything else is great. Everything works as it should, but a manual would be helpful. In my experience, it has a file problem. Adobe has to be checked and directed each time that it is used. Even if I am reopening a working file. It has a tendency to file in a previous location, rather than where I am working now. Now, Audition CC seems to decide on its own, to raid my files and place them somewhere else. Then I have to look for them and then they are refiled differently. No help from Audition, because they are not familiar with that problem. Tech help comes from India. Don't have a business. I am a church soloist on a weekly basis. I prep my tracks for singing. Modifying them as needed and as I am able. Some tracks do not lend themselves to changing, because of key changes and the background vocalists. "A quality audio editor with integration into the whole creative cloud"
I think this is a pretty powerful audio editor, especially when you consider that it's all rolled in as a part of the creative cloud suite. It adds a much more powerful audio editing then premiere can offer, and makes any kind of serious audio editing a much easier process. "Great for tasks both big and small." Once you've got the hang of what you want to accomplish, it's easy to get in and out of this program efficiently. Whether I'm mixing an original track, or editing and exporting a pre-existing one, Audition is very handy. If you're not majorly up to speed on the ins and outs of audio mixing software, it can be a bit intimidating to work with in the beginning. There are still some features I'm not fully aware of or familiar with. If you're not sure of something, Google and YouTube are your best friends. Audition looks intimidating if you're not a huge music mixer, but it's definitely a time-saver as you get the hang of it. Audition is great for when I need to make some simple edits to audio for videos, and having Premiere Pro makes the exporting even easier as they're both Adobe software. "Well balanced audio editing, mixing, recording software"
for all my audio editing needs, adobe audition is the winner. I use it to extract lyrics from instruments and i like that ! I also use it to add bass and trebble to some songs, use filter and remove noise. . Practically i can do anything in terms of audio like mixing two songs as well. I like this feature. It's not easy to use and needs a lot of time and devotion to understand and use the software The features need to be learnt with time and tutorials will be helpful but adobe doesnt have a lot of tutorial videos unless paid on third party websites. use it to mix songs and edit them ! Nice software but costly ! i mix songs, extract instruments and listen and learn to play them. This is really helpful to learn and use. Recording songs, editing them is a child's play with audition !